Last year I featured a cute set of hockey books called Thanks To My Hockey Dad and I Love My Hockey Mom. 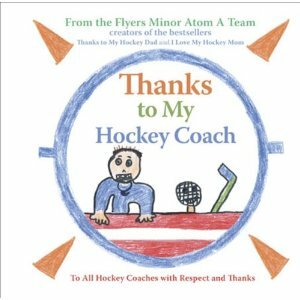 The charming little books were written and illustrated by the 7 and 8 year old boys and girls on the Flyers Novice AE Team, with a little help from coach Jason Howell, teacher/hockey mom Jennifer Sutoski and the support of none other than Don Cherry! What a great idea, and what a great way to say thank you to mom and dad for all their efforts to let their kids play hockey. The books were a tremendous success, reaching bestseller status thanks to magnificent distribution and a low price point. At some point along the way the gang realized they forgot to say thank you to coaches and volunteers. So, the gang is back in 2010, this time with Thanks to My Hockey Coach. As before the kids all contributed with their own thank yous and drawings. The reasons are varied, all touching and honest, some surprising and some down right hilarious. The drawings are equally telling and entertaining. This year the book has blank pages in the back so that your kid can come up with his or her own thank you and drawings. Folks, volunteer hockey coaches are some of the nicest people you will ever associate with. It takes a lot of time and effort, and thank yous are sometimes few and far between. If you have a hockey playing child under the age of 10, Thanks to My Hockey Coach is the perfect gift book for their coach this Christmas. And at under $10 it is may be the only reasonable price left in youth hockey today. If you are interested in this title, the team also came out with Advice for a Young Hockey Player this year, too.